Comments: Another strong entry in this entertaining series. Chance Pop Session (known as Chance Triangle Session in Japan) is a series that differs greatly from practically every other anime series I've watched. There's no overt magic, no science fiction. It's simply a down-to-earth story of three young girls - Akari, Yuki, and Nozomi - and the pursuit of their dreams. It follows the happenstance meeting of the girls on their way to stardom as students at an elite school for aspiring pop idols. Just as a warning, since this is something that threw me completely, there's a serious level of drama introduced on this disc. I can't ruin the plot, but it's safe to assume that more sensitive viewers will cry at least once. I couldn't help but get teary-eyed, myself. However, it's a rather organic event, and doesn't seem out of place for the show. Also, as we hear many times throughout the course of the show, dreams are something you make real only after overcoming hardships. I suppose I should say, as a second warning, that the show is far more concerned about character development than whiz-bang action. There are layers upon layers of conflicts, which is rather reflective of reality. There's no one obstacle that simply needs to be cleared away for success to come about. Each character possesses a fully realized personality, and watching them face what life throws at them is what makes this show worth watching. If you're not a fan of character development, then perhaps this isn't the series for you. However, if this sounds appealing, then this show delivers in all respects. Really, the entire plot is more complex than I expected. There are regular characters that appear often, though they aren't a major part of the story -- yet. This time around, we finally get to hear the old man with the funny little dog speak. Those of you who have seen the first disc know who I'm talking about. Everyone else should get the first volume and watch it. While Chance Pop Session is a visually sharp show, the animation isn't all that great. There's some live action footage mixed with one of the songs, which I'm never really fond of, and there are also a lot of static images. The visual style is very clean and soft, with elegant character designs and reality-inspired backgrounds, but we're here for two things -- the story and the music. As luck would have it, the show delivers on the musical end of things admirably. The second volume throws some new songs into the mix while keeping the previous ones afloat, and as I said in last month's review, even though they get a lot of repeated play, they haven't become annoying. The songs are performed by the Japanese voice actresses, which is impressive, as always. The music is good, as well, and this may end up being a soundtrack I'll be shopping for in the near future. The voice acting is well done in both languages, with the actresses and actors doing a good job of keeping emotion in their characters while not straying too far into melodrama. There are some questionable accents in the dub (not questionable because they're bad so much as because they're included at all -- why do Japanese people need British accents? ), and there are the mandatory random changes to the script present, but there's nothing horribly offensive. For dub fans, there's extra incentive to avoid reading subtitles since the English track has been mixed in 5.1 surround sound. That's so all of the gunshots and helicopter noises put you IN the action...oh...wait...there are no action scenes here. Well, surround sound never hurt anyone, and I shouldn't poke fun at a crew that has obviously gone the extra mile to present a well-crafted product. Once again, ADV has included a great selection of extras. There are two slideshows, one of production sketches and one of character designs. The original promotional spots are included, as well as 6 trailers for other ADV releases, a sticker sheet in the keepcase, and the second installment of ADV's guide to becoming a pop star. Sure the stickers and guide are a bit on the girly side, but again, I'd rather have more extras than I know what to do with then have nothing at all. The case conveys the spirit of the show well, this time featuring Yuki. 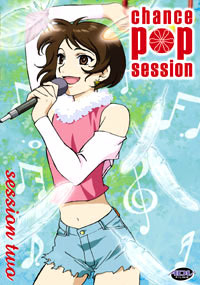 Somehow, the simple illustration and colors suggest the wistful, peppy, soft nature of Chance Pop Session. This is a nice package, and my only regret is the lack of an artbox for the whole set. If you don't mind putting off the explosions and flesh-rending violence of other shows for a pleasant, quiet, show with a powerful message, then Chance Pop Session is a great diversion. It seems a bit ironic that the show's most unique trait (for me, at least) is the fact that it almost completely represents the real world. Family, friends, and the never-ending passion for following one's dreams are the focus for this anime series, and so far, it's been extremely satisfying. If you want anime with some substance, I'd suggest adding this title to your collection -- it should please all of the dreamers out there.